Oh, Voyager. After such a great beginning, for your second episode, you give us ‘Parallax’; an episode that more or less encapsulates most of the major problems that would plague the show as a whole. As the second episode, ‘Parallax’ is about getting everyone settled into their roles, both within the fictional universe of the show and for the television audience. Janeway’s first priority is to replace her late Chief Engineer, and the main job of this episode is to manoeuvre B’Elanna Torres into that position. Unfortunately, the way it does so is both dull and nonsensical. There’s no sensible reason why Janeway would make B’Elanna, a woman who breaks a man’s nose because he annoyed her at the beginning of the episode, her Chief Engineer. Chakotay (whose name B’Elanna is currently pronouncing CHAK – oh – TAY, which is fairly amusing) insists that she’s a great engineer, but it doesn’t matter how good she is at the technical stuff – no one with such terrible people skills should be in a position of command. 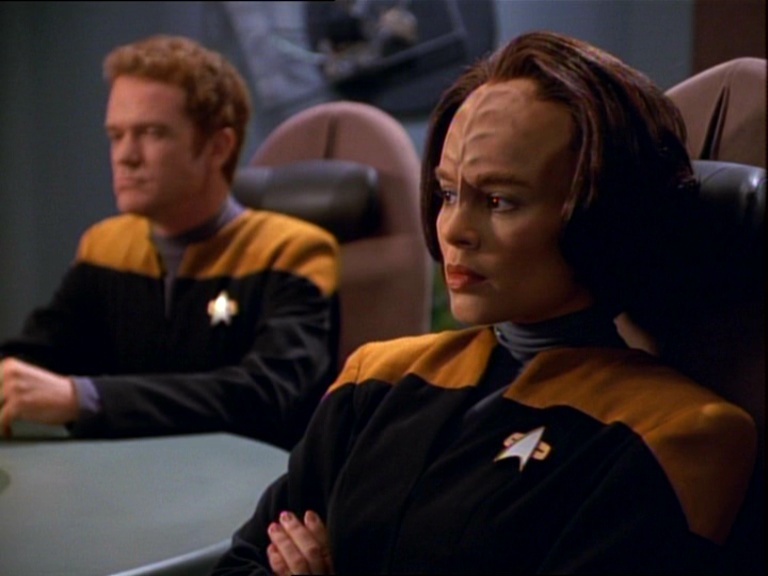 The only reason to make B’Elanna Chief Engineer is because it’s Roxann Dawson whose name is in the credits. This is bad writing. On the other hand, Janeway is so desperate to promote Tom Paris, liar, risk-taker and dropout, that she gives him not one but two positions on the senior staff – pilot and nurse/field medic. Surely there must be someone else on the ship who’s done some first aid and could be trained up as a medic? Most of them are in the armed forces, they must have some basic medical training. Choosing almost anyone else would be more logical than getting your pilot to double up as a nurse. (My friends and I decided years ago that the only way to explain several of Janeway’s actions, especially in the early seasons, is to assume that she fancies both Chakotay and Paris. Once you assume that, suddenly a lot of what she does makes a lot more sense, though it makes her a very bad captain. In this episode, she also looks like she wants to jump B’Elanna several times. This is probably not how the show-runners wanted us to view the situation). Voyager also had something of a technobabble problem. All the Star Trek shows suffer from technobabble overdose at times, but Voyager really goes to town on it. The science-fiction premise of this episode, in which the ship gets stuck in a ‘quantum singularity’ (a quantum black hole? ), is decent enough but the execution is unforgivably dull and reliant on line after line of nonsense, shouted with as much conviction as the actors can muster. They needed a technical problem for B’Elanna to solve to prove her leet engineering skillz, but they might have been better off going for a damaged warp core, that’s always exciting. There's a tiny sub-plot concerning the Incredible Shrinking Doctor, which is mildly amusing. The writers are already looking for ways to use the Doctor’s unique holographic status, which is a good sign, here suggesting that there's been some damage to his holographic projectors. The problem with this subplot is that it looks so ridiculous, it’s hard to take the character seriously. But we get some nice scenes between the Doctor and Kes, forming the beginning of a beautiful friendship, and the first of many conversations about whether or not the Doctor should have a name. Overall the main problem with this episode is that it’s simply dull. There should be plenty of juicy character conflict between the Maquis and Starfleet crewmembers, but this is so clumsily handled it quickly becomes tiresome. The writers aren’t letting their characters take them where they want to go – they’re forcing them into prescribed roles, regardless of whether or not they fit, and they’re doing it in a thoroughly tedious fashion. - Janeway is the most pro-active captain since Kirk – she goes on dangerous away missions herself. This may be because she doesn’t entirely trust her First Officer and wants him to stay where Tuvok can keep an eye on him. - Great power struggle between Janeway and Chakotay when he asks for permission to leave and she says ‘Dismissed.’ You tell him who’s boss, Janeway. - Kim tries to gossip with a Vulcan. He really doesn’t know anything, does he? - Neelix is already starting to be intensely annoying. I’m not sure if it’s the writing, the performance or both, but he grates in the few scenes he’s in. - This episode marks the first instance of Kim getting a Peculiar Space Disease. Get used to it, Harry. This gains an extra point for the fabulous line about having to punch your way through - two out of four broken noses. Thanks for reviewing a Star Trek series. Just when I thought this site could be any more awesome. I'm watching a lot of shows I've never seen before, due to this sight. I have, however, seen Voyager, although unlike the other Trek series, most episodes I've only seen once or twice. Now, thanks to Amazon Prime's streaming, I'm re-watching them. I do not have very fond memories of this episode - thankfully, it did get better. As you say, it was about this episode that I already wished Neelix would suffer some unfortunate accident or Janeway would suddenly come to her senses and banish him from the ship, but no such luck. The Doctor, as usual for anyone simply named "The Doctor," was awesome. A funny, but extremely dry wit. My favorite character of the series. I'm looking forward to more of your reviews. Thanks :) I love the Doctor. I don't know what it is about Neelix, but he is so irritating! Luckily most of the rest of the characters are likeable! Ah Neelix-always so annoying..never got what Kes could possibly see in him. Maybe she saw the good in him or something.. So Janeway excuses people's actions if she fancies them? That's a fun theory. Bet the writers didn't think of that. The Doctor is really fun as always. Neelix was like an intergalactic Joxer. Annoying, repulsive and useless all at once. Not only was there absolutely no chemistry between him and Kes, but the wall of "anti-chemistry" was so palpable you could cut it with a batleth. I always had the impression that she was with him out of a sense of obligation more than attraction. Quite the opposite with her and the Doctor, though. Those two shared genuine warmth and I always looked forward to seeing them interact.